The Donnybrook Sand Mine Case involved an appeal in 2000 in the Planning and Environment Court by CSR Ltd against a refusal of a development application for a sand mine. 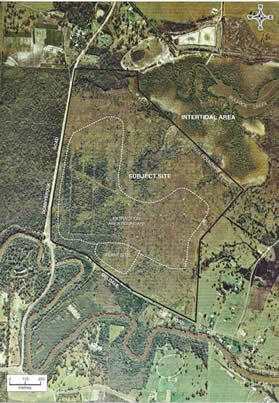 The sand mine was proposed on a floodplain in South East Queensland near the township of Donnybrook, adjacent to Pumicestone Passage and the Moreton Bay Ramsar Wetland. The site is shown on the aerial photograph to the right with the outline of the pit shown in white. The rough dimensions of the excavation for the sand mine were 1km long by 400m wide by 18m deep. The mine was expected to operate for 22 years to supply sand for concrete for use in building construction in Brisbane. A principal issue in the court case was the potential environmental impacts of the mine. The soil chemistry of the site, containing acid sulphate soils and heavy metals such as iron, and the complex hydrology of the area created a cocktail of potential ecological impacts. Because of the need to continue allowing for flood waters to pass across the mine site, the proposal involved the construction of a floodway across the excavated mine pit. The floodway was proposed to be contructed of the waste slurry from the mine. Judgment of Quirk DCJ approving the mine: CSR Ltd v Caboolture Shire Council & Ors  QPEC 013;  QPELR 398. A summary of the facts of the case, plus aerial photos and maps of the site, are available here. Following the court decision and approval by the Commonwealth Environment Minister, the sand mine commenced operation. A GoogleEarth image of the sand mine in operation in 2009 is available here. The mine operated only for a few years. It was closed in 2012 because the sand resource was found to be poor and the mine was unprofitable. Aerial photograph of proposed sand mine site used as evidence in the trial. (Source: Brown & Root (2000), Proposed Extractive Industry Operations at Donnybrook – Acid Sulphate Soil Management Plan, Figure 2.5).